We’d love your help. Let us know what’s wrong with this preview of The Business of Dying by Simon Kernick. It's a typical cold November night and Detective Sergeant Dennis Milne, a very atypical policeman, waits in the Traveller's Rest Hotel parking lot for the arrival of three men. Cynical and jaded, Milne earns money on the side by doing what he does best: punishing the bad guys. But this time he's been duped. Instead of blowing away drug dealers, he kills three innocent peop It's a typical cold November night and Detective Sergeant Dennis Milne, a very atypical policeman, waits in the Traveller's Rest Hotel parking lot for the arrival of three men. Cynical and jaded, Milne earns money on the side by doing what he does best: punishing the bad guys. But this time he's been duped. Instead of blowing away drug dealers, he kills three innocent people, their deaths starting an investigation that sees him and his conscience heading for trouble. Less than twelve hours later, Milne is out on the streets again. Eighteen-year-old Miriam Fox has been found dead by Regent's Canal---her throat slashed. Desperate to find Miriam's killer, Milne uncovers a web of depravity far more shocking than he could ever have imagined. Can he evade arrest for his own crimes and solve a case so sickening that it may provide the key to his personal redemption? To ask other readers questions about The Business of Dying, please sign up. This is my first experience with the writing of Simon Kernick. Overall I enjoyed his writing style and method of storytelling. In this, his first installment in the Dennis Milne series, I wasn't blown away by an single aspect of the novel but steady writing, plotting and an interesting twist to the regular police procedural kept me interested. Dennis Mile really is an anti-hero. Fans of such characters will enjoy this one. If you have read and enjoyed (or in my case did not enjoy) the classic The Butcher's Boy, you will find lots to like here without the feeling that the story is aged. What can I say, my friends know Simon Kernick is one of my favourite authors, members of my group " A Good Thriller", know I love his books, so how am I reading his first book? Guilty, I have read number 3, first, yes first ! Now reading part 1 in the Dennis Milne books, have read most of Tina Boyd books. But pleased to say loved this book and a great introduction to this great author, that I can recommend to all my friends, and I can tell you he gets stronger and better. Very pleased to read this b What can I say, my friends know Simon Kernick is one of my favourite authors, members of my group " A Good Thriller", know I love his books, so how am I reading his first book? Very pleased to read this books as a Book pal and my pal also gave the book four stars like myself, so happy to recommend this book and author. Dennis Milne is a cop, but a corrupt cop makes money on the side as a killer for the bad guys, but the question I asked myself and you, does this make him a bad guy? He main case is a murder of a eighteen year old prostitute Miriam Fox, but there is so much more to this gripping, taut cop thriller. With great story telling, strong characters, great twists and shocks at a fast pace, I just know why I always come back to this author, not many authors can keep up the pace as Simon Kernick does in his books. A different type of police story/mystery. Our hero/anti-hero is Officer Milne, a divorced, hard drinking, smoking cop. He's good at his job - interviewing miscreants and using logic to jump between different hypothesis. The bad side - he moonlights for extra money by dallying into some of the same things he arrests others for. In his day job, he's on the trail of someone who has murdered a young lady. It turns out this could be part of a series of killings. While investigating, our guy also balan A different type of police story/mystery. Our hero/anti-hero is Officer Milne, a divorced, hard drinking, smoking cop. He's good at his job - interviewing miscreants and using logic to jump between different hypothesis. The bad side - he moonlights for extra money by dallying into some of the same things he arrests others for. In his day job, he's on the trail of someone who has murdered a young lady. It turns out this could be part of a series of killings. While investigating, our guy also balances on the sword of justice because officers in another jurisdiction are searching for him for his latest night job. “Three murders and now we got a witness.” Dennis and Danny have just finished shooting three hoodlums behind a house. Dennis is Detective Sergeant Milne and he kills criminals. In this case at the behest of criminals. DS Milne is also a very tenacious cop and is in the midst of an investigation into the death of Miriam Fox. He has reason to suspect that the pimp all the evidence points to may not be the actual killer; something just doesn’t seem right, especially as another runaway has disappeare “Three murders and now we got a witness.” Dennis and Danny have just finished shooting three hoodlums behind a house. Dennis is Detective Sergeant Milne and he kills criminals. In this case at the behest of criminals. DS Milne is also a very tenacious cop and is in the midst of an investigation into the death of Miriam Fox. He has reason to suspect that the pimp all the evidence points to may not be the actual killer; something just doesn’t seem right, especially as another runaway has disappeared and is presumed to have been killed. Everyone else is just thrilled to close out the case. But things are beginning to spiral out of control as the witness to his killing (the supposed bad guys turn out to be Customs officers) has managed to produce an ID-drawing that remarkably resembles Milne and Raymond, the guy who ordered and paid for the hit, now wants to tie up loose ends. This year - 2015 - I'm making it a point to read thriller series from the beginning instead of dipping into them randomly. Of course it seems almost every author these days has some series on the go along with their stand alone novels so there's a lot of reading ahead of me, lol. My first read of 2015 is Simon Kernick's The Business Of Dying which turns out to be "Dennis Milne #1" This was a pretty good read - good enough for me to want to continue reading the other 2 books in the series. This was Simon Kernick's first book as an author and was a good honest attempt, which was very enjoyable to read. He is one of my favourite suspense authors but do know that other books he wrote later on build on this early promise. This was a very unique take on a story with a Detective a Sergeant (Dennis Milne) being a hit man! Read and enjoy. Like Lawrence Block's assassin Keller, you will just love cheering for Dennis Milne. Great new series. Can't wait to read the second installment. Great pace superb writing. A steady 3 stars. Good holiday read as easy to pick up and remember where you left off. He made me think a bit of Strike, but more not as endearing. Would read the next one, if I found it on a shelf, but not champing at the literary bit to rush out and buy it. Dennis Milne är den mest korkade och inkonsekventa polisen någonsin. Så denna bok sög. 10/10 skulle inte rekommendera. 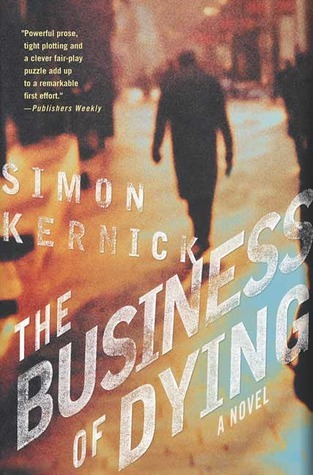 'The Business of Dying' is the debut novel by the British novelist, Simon Kernick, published by Bantam in 2002. Since the publication of this novel Kernick has written twelve more novels, several of which feature Dennis Milne, the main character & first person narrator of this novel. Dennis Milne is a full time police officer, part time 'killer-for-hire'. Milne is a 20 year veteran of the police force, who has become disillusioned & cynical about his job & humanity in general. His extracurricular employer is a hood by the name of Raymond Keene, ostensibly a businessman, who amongst other enterprises, operates a funeral home. Milne has carried out several hits for Keene & rationalizes his hits as justice meted out to those who deserve it, but would likely evade punishment. Milne regards the justice system as weak & impotent. He sees himself as a champion of justice &'judge-jury-executioner'. Keene instructs Milne to kill 3 men. Only after the hit does Milne learn that Keene has misled him & the men he has killed are two customs officers & an accountant. Keene explains his deception by telling Milne the three men were corrupt, but Milne knows the police will not rest until the three men's killer is brought to justice. At the same time, Milne is investigating the murder of a teenage runaway-turned-prostitute & the possible disappearance of another girl. He suspects Keene may have something to do with this case, but struggles to find a connection. Things start to unravel for Milne when he learns the witness who saw him gun down the men, has given a detailed description to the police & an identikit portrait is his spitting image. Milne's accomplice, Danny, the brother of an old girlfriend, is the nervous type & voices his concern about the inevitability of their capture. This makes Milne nervous & he begins to wonder if he will have to 'take care' of Danny. However Danny disappears & Milne suspects Keene has killed Danny. Milne realizes that if Keene has dispatched Danny, then surely he must be next. What follows is a dance of death, involving Milne, Keene & various other dodgy characters. I like the premise of this story. The policeman-as-killer scenario, although it's hardly original. James Ellroy, to name just one author, has used a similar scenario. In my opinion this was a story with a lot of potential; the dodgy criminal characters, the sleazy backstreets of London, street level prostitution, drug addiction & it's unhappy consequences. Where Kernick let himself down a little, is not fully realizing the potential for a really taunt crime thriller. What i thought was missing was atmosphere & characters the reader could empathsize with. Having said that i thought this was a good first novel. I look forward to reading Kernick's subsequent novels, particularly those novels in which Dennis Milne appears. I'm sure Kernick would have learned from this first novel. I give this novel 3 out of 5 stars, maybe 3 1/2. There is an interesting story I have to tell about this book/series, before I come to the actual review. When I started reading Kernick's books, the first one I read was The Payback. When I came to know there was another part about Milne, I bought A Good Day to Die, finally realizing, that I had read the whole series in the wrong way. So after I recently finished one of Kernick's later books, I decided to read all of them in order. Finally. Dennis Milne is a cop, who's very frustrated. While reading, we get to know, that he is not allowed to use weapons, he does not get promoted, and criminals -the way he sees it- can do whatever they want, because the English law protects them, rather than the innocents. So part-time Dennis works as a killer- BUT he only kills criminals. At least that's what he intends to do, because he gets set up and kills the wrong people. The book is told in first person, from Dennis' POV. Apart from the last chapter, where he tells us what is happening to him right then, he tells us about events, that have already happened. It's interesting to see, how the police system in England works, although I was a little bit confused when it came to the exact position characters had. DS, DC, DI if i got them right now. I can't tell you which of them is the higher rank, and not all of them were explained, I think. Also, as I am from Austria, it was kind of a shock for me, that policemen in England have to fight crime unarmed...? Is this still the case? Kernick's style of writing is quite fluent and was not hard to understand. Although I have to admit that I read the translation. Nonetheless I've also read some of his later books in English, so I think I can tell. Dennis Milne, (ex)cop and part-time killer. From the moment I first read about him, I was fascinated by his character. On the one hand he wants to do good, help people, make the world better, but he feels so restricted that he has to use other, illegal, means to accomplish this. It's interesting, how he makes a difference between criminals, which he can kill without mercy, and innocent people where he gets nightmares because he killed them. As the book progresses, and his possibilities get more and more limited, his actions become more and more illegal, brutal, cold. Nonetheless his change is well made and believable and in the end he can still tell good from bad. Even after it was clear that he could not go back to his old life, he still wants to find the killer of some underage prostitute. As you might have already guessed, I love this book. I very much like Dennis and his way of acting/thinking. Kernick tends to have some very manly (does this sound weird) characters, for which I love him. The story is funny, and apart from Dennis' (more or less) personal problems, he also gets to solve a murder. I loved how both storylines progressed at the same time, and especially, that one was not more, or less important than the other one. The novel starts out fast, with a coldblooded execution of three men. Within minutes the deed is done and the perpetrators even have time to change escape vehicles. It's just like Milne said at the beginning of the story: if you're going to kill someone, plan it. But, despite careful planning, there is a witness, and when the cop in him spares her life, his decision comes back later to bite him. As the opening scene illustrates, The Business of Dying is not for the faint of heart; there is no la The novel starts out fast, with a coldblooded execution of three men. Within minutes the deed is done and the perpetrators even have time to change escape vehicles. It's just like Milne said at the beginning of the story: if you're going to kill someone, plan it. But, despite careful planning, there is a witness, and when the cop in him spares her life, his decision comes back later to bite him. As the opening scene illustrates, The Business of Dying is not for the faint of heart; there is no lack of violence, brutal slaughter or (teenage) prostitution. Innocent people are scarce, everyone has skeletons in his or her closet, bad guys don't always get caught, rainy days drain the joy from life and there seems to be incessant smoking; Kernick's London makes a credible background for film noir. What better protagonist to feature against that backdrop than Dennis Milne, hardboiled detective anti-hero? He is the embodiment of the good cop gone bad. One bad decision a long time ago set back his career, after which he started doing some shady business on the side to supplement his meager salary. Milne eventually graduates to the occasional contract killing, but he probably sees it as vigilantism, as he's doing society a favor by taking out criminals. But what exactly is his definition of a criminal? According to Milne, some thugs can be useful while others are decidedly not... he conveniently neglects to clarify where he himself belongs. The storyline itself is put together soundly, slowed down here to showcase the day-to-day dealings of Milne, sped up there to catch him running from his enemies. Dennis Milne is an average man, with simple desires and a(n albeit distorted) sense of duty. It's a disturbing thought, but there are probably many thousands if not millions of very similar men in this world. A few questions I kept asking myself were: what distinguishes Milne from any other murderer? Should Milne die at the hands of his persecutors? Or does he deserve to escape unscathed? Is there a way for him to gain redemption? “The Business of Dying” is this author’s first book so after enjoying his latest books immensely I knew I had to go back in time to search out the roots of this author’s imagination. Mr. Kernick’s first novel is a mystery with a twist providing the reader with plenty of action and intrigue. The engaging protagonist, Dennis Milne, a full time cop and part time murderer, is always at the heart of it all. The storytelling flows smoothly and delivers a saga that engulfs your imagination till the last “The Business of Dying” is this author’s first book so after enjoying his latest books immensely I knew I had to go back in time to search out the roots of this author’s imagination. Mr. Kernick’s first novel is a mystery with a twist providing the reader with plenty of action and intrigue. The engaging protagonist, Dennis Milne, a full time cop and part time murderer, is always at the heart of it all. The storytelling flows smoothly and delivers a saga that engulfs your imagination till the last page. The story is fast of the mark with the coldblooded execution of two customs agents and an accountant. This assignment is handed to Dennis by London’s toughest members of society the underworld elite that expects results, with them failure is not an option. As a reader my attention was immediately seized by the captivating description of London’s underbelly life, a world that is generally hidden from the public and a culture that thrives on fear and secrecy. Dennis’s day job as a London detective investigating the death of a young girl found by the side of a canal is on a direct collision course with his underworld assignment. Working both sides against the middle is a no win situation that puts Dennis in the very precarious position of being the hunter and hunted at the same time. The result is an edge of the seat drama that turns into Dennis’s worse nightmare. He becomes a man on the run with no place to hide. The author has combined an interesting first person narrative with emotionally complex characterisation. Dennis is portrayed as a person with a Jekyll and Hyde personality. The powerful prose, tight plotting, clever structure and the conundrum Dennis is faced with are the driving force behind this novel. With Dennis on the run I can’t wait to see what the author has in store next. I picked this up after reading Relentless - a book which didn't promise much but delivered beyond expectation. The Business Of Dying is Kernick's first novel which is apparent from the off - not quite as polished as his later books it still revolves around his strongest idea yet, that of Dennis Milne full time cop, part time murderer. A man with a twisted moral compass, he's sent to kill 3 drug dealers but it immediately goes awry when it becomes clear these men were not drug dealers and not corrupt. The thing is the book doesn't then descend into so much postulating about the rights and wrongs - Milne has this figured out already, he's intelligent enough to realise this is a bad situation, but the importance of surviving compels him ever forward, and that's what makes the book exciting. Its not a moral lesson, its a story about survival in a fucked up world. The book is then pushed into overdrive as Milne becomes embroiled in an investigation that he can't let go and slowly but surely the two intertwine - not in a coincidental slapdash way, but a very deliberate execution of a believable plot that drags you slowly in. The final third of the book slips easily from twisted detective thriller to full on revenge action with a neat intelligent ending and the book makes no excuses for the actions of its central protagonist. Some books maintain an even keel, some books dip in the middle and some books dip at the end. This is one of the few that gets better throughout until the biting crescendo. Simon Kernick's debut novel introduces DS Dennis Milne, a tough, jaded, boozing cop with a sharp mind but flexible morals. Milne has a sideline to earn some extra cash. He's paid by criminals to kill other criminals. Things get a little complex when he has to investigate a triple murder he's just committed. He discovers the dead men he killed were two customs agents and an accountant, which doesn't jibe with what he was told when he accepted the contract. In his legitimate job, Dennis is also in Simon Kernick's debut novel introduces DS Dennis Milne, a tough, jaded, boozing cop with a sharp mind but flexible morals. Milne has a sideline to earn some extra cash. He's paid by criminals to kill other criminals. Things get a little complex when he has to investigate a triple murder he's just committed. He discovers the dead men he killed were two customs agents and an accountant, which doesn't jibe with what he was told when he accepted the contract. In his legitimate job, Dennis is also investigating the death of a young girl found by the side of a canal. Eventually these two cases will be connected and Dennis will be in the uncomfortable position of being the hunter and hunted at the same time. The result will turn into Dennis's worse nightmare as he becomes a man with no place to hide. Só tenho pena de ler lido o 2º livro do Dennis Milne antes deste mas pronto, na altura nao o tinha e tinha gostado bastante do livro que tinha lido do Simon Kernick. O Dennis Milne nao é um detective tradicional, nem bonzinho, o que o torna, quanto a mim, original. Not bad. I was already hooked on Simon's writing thanks to and other titles. But this was his first. Kind of hard to get behind a killer cop, but somehow Simon makes it work. I will for sure move on to the 2nd book in this trilogy: . Recommended by others & was glad I took their advice, DS Denis Milne is an engaging & likeable character despite his obviously flawed morales with his main profession. An easy read with enough twists to keep you going & was defo a pg turner, will be back for the next in the series. Gritty and incredibly violent, this is no story for wimps. Follows the format of a police procedural, but we know from the very beginning that the detective moonlights as a hit man....so there are more plot layers than usual. The first book in the Dennis Milne series by Simon Kernick. This excellent debut novel is well worth reading as is Simon Kernick's other work. After a shaky start so glad I persevered as thoroughly enjoyed this book and looking forward to the next one! What happens, if a cop also is a contract killer? There have been some stories with a similar arc in the past years, but The Business of Dying is one of the earlier books (2003). It’s also a book on the cop himself as the anti-hero, which makes me relate it to Dexter (as TV series as well as the original books), where it is some CSI guy being a serial killer, or remotely related to Dark Justice (TV series). There is not much similarity in the settings though. Simon Kernick’s “hero” is the long se What happens, if a cop also is a contract killer? There have been some stories with a similar arc in the past years, but The Business of Dying is one of the earlier books (2003). It’s also a book on the cop himself as the anti-hero, which makes me relate it to Dexter (as TV series as well as the original books), where it is some CSI guy being a serial killer, or remotely related to Dark Justice (TV series). There is not much similarity in the settings though. Simon Kernick’s “hero” is the long served cop Dennis Milne. Unsatisfied with how law often fails on putting the bad guys to jail, he started taking kill-jobs on criminals. In The Business of Dying he is played foul, and suddenly he becomes a hunted killer as well. There are several turns and twists making the story interesting and suspenseful, even one does not really like Milne for being a killer. Especially, as one never knows about friends being friends or foes until the very ending. The hero of this novel is a complicated man. He's leading a double life. In his day job, he's a sergeant with the Met Police, investigating and arresting criminals. In his second, secret life, he's a professional hitman, paid to end the lives of others. When we meet Dennis Milne, he's waiting for his next targets to arrive. He does the job and takes them out, but things are about to spiral out of control, changing Dennis' life irrevocably. This book is well-written and Dennis Milne is a rounded The hero of this novel is a complicated man. He's leading a double life. In his day job, he's a sergeant with the Met Police, investigating and arresting criminals. In his second, secret life, he's a professional hitman, paid to end the lives of others. This book is well-written and Dennis Milne is a rounded character for all that he's hard to like. One of his redeeming features is that even while his sideline is threatening to implode his life, he's still working the case in his day job, investigating the murder of a teenage prostitute. Dennis is surrounded by jittery accomplices, shady "businessmen" and uncooperative witnesses. As things go south for him, Dennis has to use the skills of both sides of his double life to stay ahead of his pursuers, both police and criminal. An readable/listenable novel with an unlikely and not very likeable protagonist and barely credible storyline. The plot involves a detective sergeant of police who has made a nice, hidden pot of cash by killing baddies who have not been brought to justice but should have been ... or at least that is his contention. Narrated in the first person in an attractive British accent (to this Aussie anyway), the first third or so of the book is interesting enough, but the story more or less deteriorates until a rather unsatisfactory and unlikely denouement. I really enjoyed this book. There were times when I was getting really excited whilst looking at my kindle. My first Simon Kernick book and definitely not my last. A few parts in the story were a bit weak. The ending, for me at least, wasn’t the best. And the ‘twist’ or part where everything ‘clicks’ was quite good but also a little random and rushed. I felt like I spent a few nights getting into the story and then on the last night is was over. Anyway I’ve heard similar things from other reviewe I really enjoyed this book. There were times when I was getting really excited whilst looking at my kindle. My first Simon Kernick book and definitely not my last. Anyway I’ve heard similar things from other reviewers and they make a great point that this is Kernicks first book. I’m definitely going to read the 2nd, maybe as my next read. Detective Milne narrates the story almost like he was telling a 1940s hard boiled detective novel. He's not a nice person, though he comforts his conscience by following his own moral code... until he gets duped into committing a crime that violates his code. While avoiding his own detection, he continues to investigate the murder of a young prostitute, sensing that the man arrested was not the perp. The book itself has a number of typos and layout errors that were distracting. Shame on the publi Detective Milne narrates the story almost like he was telling a 1940s hard boiled detective novel. He's not a nice person, though he comforts his conscience by following his own moral code... until he gets duped into committing a crime that violates his code. While avoiding his own detection, he continues to investigate the murder of a young prostitute, sensing that the man arrested was not the perp. I seem to either love or loathe this authors work, this one falling more towards love as I quite liked it. It's a good thriller which sees the introduction of Dennis Milne. As I read the follow up to this first I did have a notion of how things were going to go but that didn't stop it being an enjoyable & gripping read which, in typical Kernick fashion, it moves at a fast pace. Certainly one of his better ones to my mind at least. “Dennis, please. I don't know what-"